‘Sometimes, the needy are so weak and helpless, that they do not have the strength even to go and receive help. There are also times when they cannot even ask to receive, although the giver is right before them. In such cases, the giver ought to go to the needy person’s home and complete the gesture. Moreover, the sacred thought behind any charity is to make good the shortcomings or the lack that exists in society at the social and personal level,’ as written by Shri Aniruddha Bapu in the first volume of Shrimad Purushurtha Granthraj. Even today, there are families in India who after toiling throughout the day, do not get enough food to eat. How then will such people, who do not get a one-time meal properly, send their children to school? And even if they do, how would these children study? An empty stomach vouches for neither complete concentration nor does it helps in building up a child’s health. This, in turn, will cause hindrance in the development of this generation. If the students are provided with good food and nutrition, they will not only attend school but will show continuous improvements in every field. 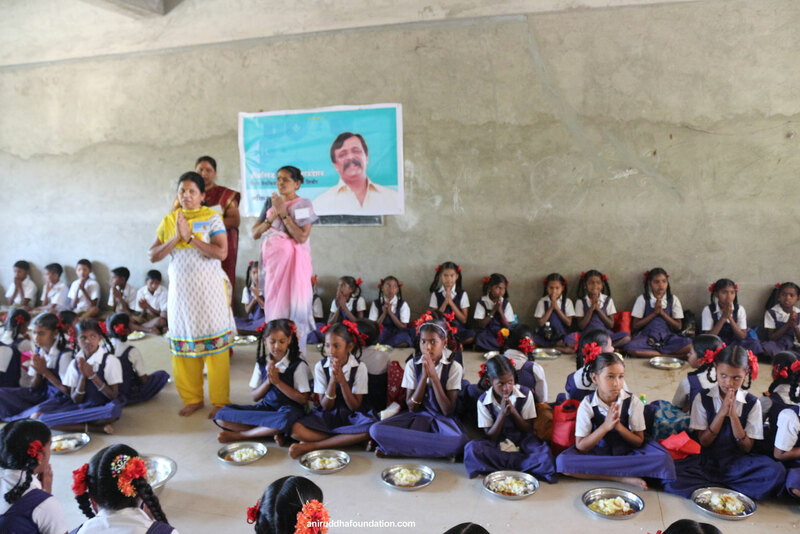 It is with this thought process that Shree Aniruddha Upasana Foundation and associated organisations started a programme called ‘Annapoorna Mahaprasadam’ in 2007, under the guidance of Sadguru Shree Aniruddha Bapu. Carrying unconditional love in the heart for their Sadguru, a Shraddhavan donates food, and with the same love and reverence, one cooks and feeds the students in the schools. With this selfless service and devotion, the meal is transformed into “Prasad of Mata Annapoorna”. And hence, Sadguru Shree Aniruddha Bapu has rightly called it ‘Prasadam’. This is accomplished with the grace of ‘Devi Annapoorna’, who fulfils the need of food and provides nutrition to everyone, which is why the programme is named as ‘Annapoorna Mahaprasadam’. Shraddhavans can donate grains, oil, and other necessary (raw) materials under this programme. All the grains and other raw materials donated are distributed among the needy schools at various places. In these schools, Shraddhavans go and cook lunch for the students and then feed them all by themselves. By making an effort in such a way, a Shraddhavan performs the good deed of donating food as well as by offering the service of cooking food; they seek blessings of their Sadguru which in turn wipes their ill-fate. Students acquire the essential physical strength required to pursue education through the food served under this programme which in a way is a step in the direction of empowering India. The programme has been initiated with the objective to provide school children with balanced and nutritious diet in their schools and that to encourage parents to send their children to school every day, atleast with the thought of receiving afternoon meal. Thus, this programme has been initiated to overcome the problems related to hunger and education. ‘Shree Aniruddha Upasana Foundation’ accepts food donations in the form of grains, pulses, oil, spices and other raw materials required to cook a meal at Aniruddha Gurukshetram Khar (West), Mumbai. Also, donations are welcome at any other Foundation approved Upasana Kendra. Furthermore, food donations are also accepted on Thursdays at Shree Harigurugram, New English School, Bandra (East), Mumbai. Post collection, all the donations are transported to the remote village settlements of Virar, Thane close to Mumbai. Shraddhavans living in the same or nearby locality travel to the local school to cook food for the children willing to study there, thus providing daily fresh meals to the students, cooked with love by the Shraddhavans. As the meal ends, the Shraddhavans make every effort to clean the kitchen area and the cooking vessels, thus maintaining a neat and habitable school premise. In this way, they offer their efforts onto the lotus feet of their Sadguru. Under the Annapoorna Mahaprasadam programme, services are offered to more than 20 different schools by Shree Aniruddha Upasana Foundation. Around 250-300 students avail the services delivered with love by the Foundation at Vidya Vaibhav Vidyalaya located at Kelve Road. The students hail from families that have a tribal background or are daily wage labourers. More than 20 schools are served on behalf of ‘Shree Aniruddha Upasana Foundation’ under the Annapoorna Mahaprasadam Yojana. For example,250-300 students of Vidya Vaibhav Vidyalaya, Kalve Road, are being benefitted from this programme. These children belong to the hard-working tribal community or from other working-class families of the Shraddhavans of Virar, Saphale and Mykhop upasana centers are active in this service. Everyday lunch that includes pulses, rice and vegetables is served to these children. These Shraddhavans carry out all the essential work for this programme, all by themselves. For schools running in two different time slots, our Shraddhavans prepare and serve food within the duration where the two slots are separated, i.e. 11:30 am to 02:00 pm, thus making every effort to provide every student with freshly prepared warm meals. Till date, over 700-800 Shraddhavans have offered their services through Shree Aniruddha Upasana Foundation and similarly aligned establishments. Despite having their days busy with individual jobs or business, all Shraddhavans actively and lovingly take part in this program. Almost 9000 students from 100 different schools visit the annual Kolhapur Medical and Healthcare Camp conducted at Pendakhale, Kolhapur. 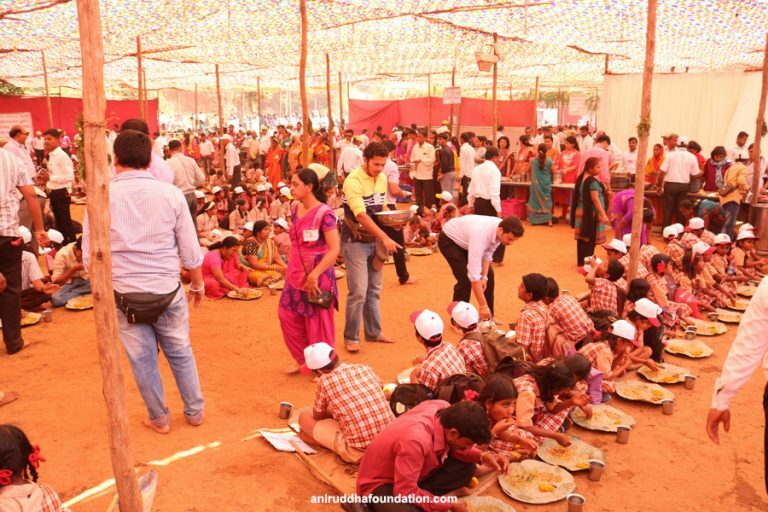 Besides enjoying and relishing the food provided under the ‘Annapurna Mahaprasadam’ program, the students are humble enough to wash their own plates and cutlery after every lunch. These students chant the verse, “Vadani kaval gheta…” before beginning the lunch without fail. It inculcates a good moral value of thanking God for His loving grace in the form of food. The Annapurna Mahaprasadam program does not run only to feed people and eradicate hunger. What makes it furthermore interesting and important is the fact, that it contains multiple facets of making the young and all the future generations mentally, physically and spiritually strong and complete.